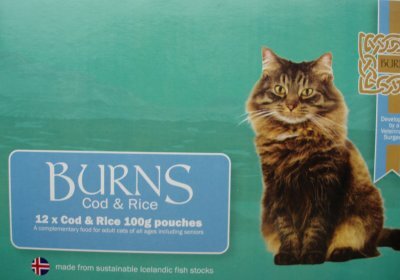 Burns Cod and Rice Wet Cat Food is a complementary cat food, the manufacturers say. It is available in the UK. I thought I would try it. I am (almost desperately) looking for something that is of a higher quality than the cat food found in Supermarkets in the UK. This short post is a brief review of this cat food. At the moment I am feeding my cats a range of foods including Whiskas Delicious Meals in Jelly. They all pretty much like it. It contains the usual levels of protein (8.5%) and ash (2.5%). It costs £3.75 at a local supermarket. It can be bought considerably cheaper at the big supermarkets. Well, on the box it says that the protein level is lower than for Whiskas at 1.1% (is this a vegetarian food!) and the other ingredients are at similar levels. Am I missing something? Protein is stated as being at 11% and further it says on the box and website that the product contains 88% cod minimum. Well, I thought fish was protein but of course there is a lot of "moisture" (water to you and I). So things don't really stack up as far as I can see. Except if we conclude that the cod is mainly water. Manufacturers do inject water into fish even fish for human consumption. Did my cats like it? Three cats tried it and two didn't like it. The third left large amounts of it. It does smell nice though (to me! but apparently not the cats). It is hypoallergenic, it is said. The price? : A box of 12 sachets is £9.69 (6th Jan 2010). This is more than 2.5 times the price of Whiskas. Delivery though is very quick when ordered from the Burns website. Conclusion? It just is not worth the price. And in any event it is complementary and the cats don't like it that much. You stated that you use Wiskas. I havent seen the kind in the jelly but my finicky bunch only will eat wiskas once in a while. Im talking about wet again as it too for my cats is only suplementary. I recently read an article on cat nutrition, CATS of last year and it said that cats should get wet food at least twice a day to make sure they get enough moisture in their diets. My cats love the new Fancy Feast appetizers. There isnt much in the little plastic tray and its very expensive ($1.20 cents) per little tray. Since I have 3 cats they each get a very small portion. They also like the Meow Mix wet in the small plastic cups. I also give them Fancy Feast in the blue cans. Again they all are small so they really dont get a whole lot which is why I give them wet 3 times a day. I tried the large cans of Friskies Indoor formula and they just licked the gravy off. The Fancy Feast in the small cans (name has slipped my mind) has several flavors that has a white sort of gravy and that kind seems to make them throw up once in a while so I stopped buying it. It comes in a Blue can called Medleys (i beleive) Its not too expensive about 70 cents a can at Wal Mart, 75 cents a can at Pet Smart. But when you try to satisfy 3 spoiled cats at the same time what am I to do. They get their dry all day free choice.